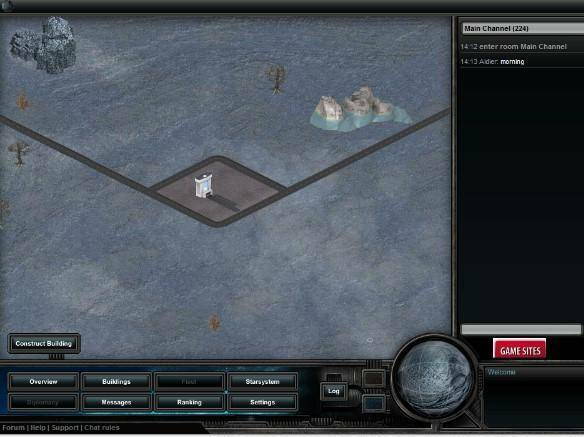 Empire Universe II is a Free to play MMO Space Strategy genre game, developed by Looki Games for Internet Browser plataform games. In Empire Universe II players can play as one of nine available races, each of which has individual stats and unique starting position within the galaxy, and must explore dangerous territories to mine asteroids, salvage wreckages whilst fighting off dangerous enemies. In this free to play space shooter MMO the battle among the stars will be won or lost depending on who can control the flow of resources, with up to 10 different resources to gather, players will captain their own warships and fight for their own people in this battle for survival. Though there is competitive gameplay against other rival factions there is also a strong cooperative element that promotes team play. As a new player you will be untouchable for 30 days and blessed with “noob protection”, giving you the chance to learn how to play the game, build up the defences and structures on your planet, start your technology research and begin discovering and mining resources with full protection and knowledge that you cannot be raided in this period. This protection only extends to your planet and your fleet is still vulnerable to enemy players, after the 30 days you enter “bashing protection”, which in turn will end once your score reaches 250,000 points. There is an in-depth level of involvement in Empire Universe II, everything from the level of detail and customisation of your warships, with 21 available chassis, modular components that can be put together to create a working spaceship, prebuilt ships that can be reconstructed and upgraded gives a full hands-on experience of full fleet management. Unlock the 146 technologies from the tech tree, researching them over time, the focus is on long-term gameplay and strategy working out your current needs and managing them effectively. Take your fleet and do what you will; pirate wandering trade vessels, take on bounties and make your living as a bounty hunter or prepare for all-out war and attempt to conquer a rival players planet. Either go at it solo band together with other players and either join or create an Empire, pooling your resources and military strength there are over 120,000 planets right for the taking spread out over 10,000 different sectors, it’s up to you how much of that you wish to claim for yourself through diplomacy and conquest.